We are number 1 right? USA! USA! No one can beat our wealth creation machine, our economic dynamism, our level playing field and our bastions of higher education. We have a middle class that is the envy of the world, right? Well, like so much of the “American dream” we have been force fed for a generation or more, this perception is not based in reality whatsoever. Sure it may have been the case for a couple of decades immediately after World War 2. Before the military-industrial-Wall Street complex fully took over the political process, but it certainly isn’t true any longer. Myths die hard and this one is particularly pernicious because it prevents people from changing things. The data in that article was based on a comprehensive study published by Credit Suisse titled Global Wealth Data Book. Well, the 2014 version is now out, and the results are not pretty. A recent posting detailed how upper middle class Americans are rapidly losing ground to the one-percenters who averaged $5 million in wealth gains over just three years. It also noted that the global 1 percent has increased their wealth from $100 trillion to $127 trillion in just three years. The information came from the Credit Suisse 2014 Global Wealth Databook (GWD), which goes on to reveal much more about the disappearing middle class. Even the smaller estimate of $2.3 trillion per year is more than the budget for Social Security ($860 billion), Medicare ($524 billion), Medicaid ($304 billion), and the entire safety net ($286 billion for SNAP, WIC [Women, Infants, Children], Child Nutrition, Earned Income Tax Credit, Supplemental Security Income, Temporary Assistance for Needy Families and Housing). In 2005, for every $1 of financial wealth there was 66 cents of non-financial (home) wealth. Ten years later, for every $1 of financial wealth there was just 43 cents of non-financial (home) wealth. Over 90 percent of the assets owned by millionaires are held in low-risk investments (bonds and cash), the stock market and real estate. Business startup costs made up less than 1 percent of the investments of high net worth individuals in North America in 2011. A recent study found that less than 1 percent of all entrepreneurs came from very rich or very poor backgrounds. They come from the middle class. On the corporate side, stock buybacks are employed to enrich executives rather than to invest in new technologies. In 1981, major corporations were spending less than 3 percent of their combined net income on buybacks, but in recent years they’ve been spending up to 95 percent of their profits on buybacks and dividends. Oxfam reported that just 85 people own as much as half the world. Here in the US, with nearly a third of the world’s wealth, just 47 individuals own more than all 160 million people (about 60 million households) below the median wealth level of about $53,000. The upper middle class in the US, defined as everyone in the top half below the richest 20 percent, owns 11.9 percent of the wealth. 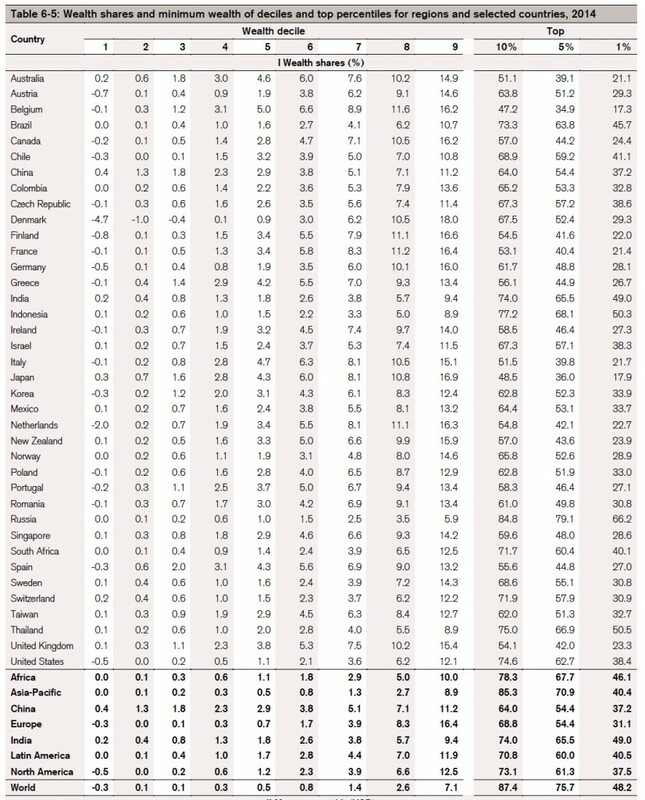 Indonesia at 10.5 percent and Russia at 7.5 percent are worse off, but in all other nations the corresponding upper middle classes own 12 to 27 percent of the wealth. America’s bottom half compares even less favorably to the world: dead last, with just 1.3 percent of national wealth. Only Russia comes close to that dismal share, at 1.9 percent. 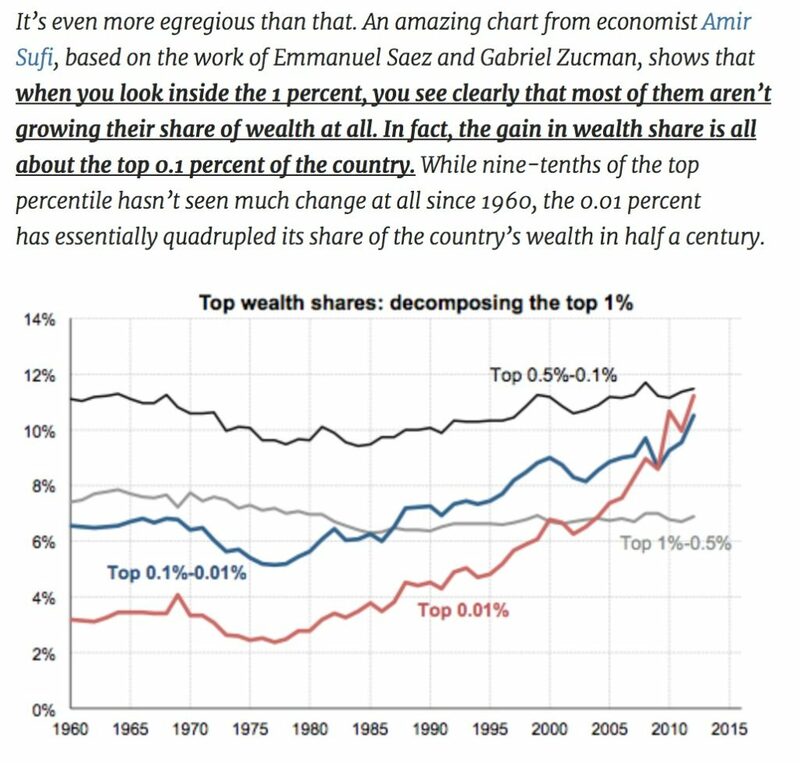 The bottom half in all other nations own 2.6 to 10.2 percent of the wealth. As in the US, the middle class is disappearing at the global level. An incredible one of every ten dollars of global wealth was transferred to the elite 1 percent in just three years. A level of inequality deemed unsustainable three years ago has gotten even worse. While Paul’s observations are very important, I take issue with one aspect. Although his stats on the 1% are accurate, the truth is that the 1% have largely been treading water over the last few years. It is actually the 0.01% that have made all of the gains. Thus the transformation of America into an oligarchy (which was recently proven in an academic study). Oh, and if you’re wondering how the American middle class ranks in the latest data, it improved two spots to #25. Just behind Greece.